Bandon is known as a favorite place among photographers and other lovers of dramatic coastal scenery. The scenic overlooks at Coquille Point and Face Rock are very popular with visitors and locals alike. 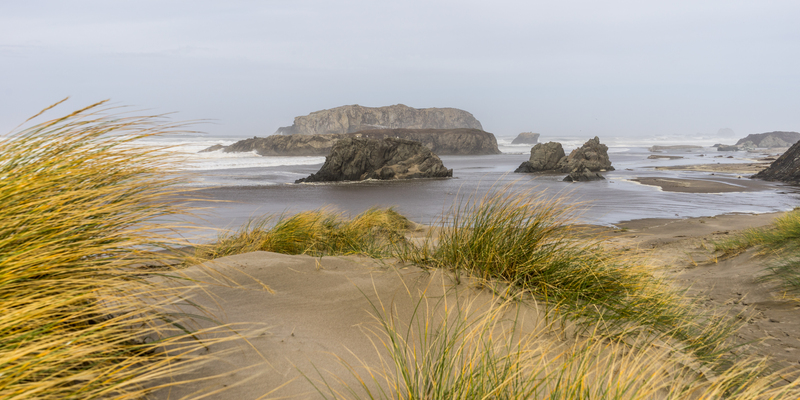 Just south of town, Bandon State Scenic Area is another and larger state park that is less-often visited and offers great views and beach solitude. There are three main access points to this area from Beach Loop Road. From north to south, the first is Devils Kitchen, which is the most developed and has picnic tables, restrooms and a large parking area. There is a short trail down to the beach and nice views of the seastacks offshore and to the north. About half a mile to the south there is a short road to another parking area. This one has a heavily-overgrown trail that eventually leads to the beach, but it does not seem to be worth the effort. There are picnic tables at this site as well. Another quarter mile south is the entrance to the parking area at China Creek. This area has great views and access to the beach, but be prepared to wade one or more of the streams that cross the beach from the creek. Bandon Natural Area extends another 3 miles south from here, but there are no roads to easily access it. This would make a wonderful beach hike from the China Creek parking area, and the chances of seeing other hikers along the way is low. The area south of China Creek is off-limits to dogs during plover nesting season, March 15 to September 15.